Presented by Mobile M+ – Live Art, this site-specific installation by Hong Kong artist Frog King Kwok (aka Frog King) reinterprets his seminal historical works from the mid-to-late 1970s. Long well known as his artistic persona ‘Frog King’, Kwok is increasingly recognised for his pioneering role in introducing conceptual, process-based, and performance art strategies in Hong Kong and China. His temporary installations made from all manner of found objects and everyday, non-artistic materials have been presented in exhibition venues and public spaces around the world. Kwok’s installation will be complemented by a digital slideshow of haunting images of performances by Japanese-American artist, choreographer, and dancer Eiko Otake. The images are taken from the A Body in Fukushima series shot by photographer/collaborator William Johnston in the radiation-damaged areas near Fukushima as part of Otake’s A Body in Places project.Connecting Space will serve as a ‘hub’ during the run of Mobile M+: Live Art hosting educational and public programmes including artist talks and panels. 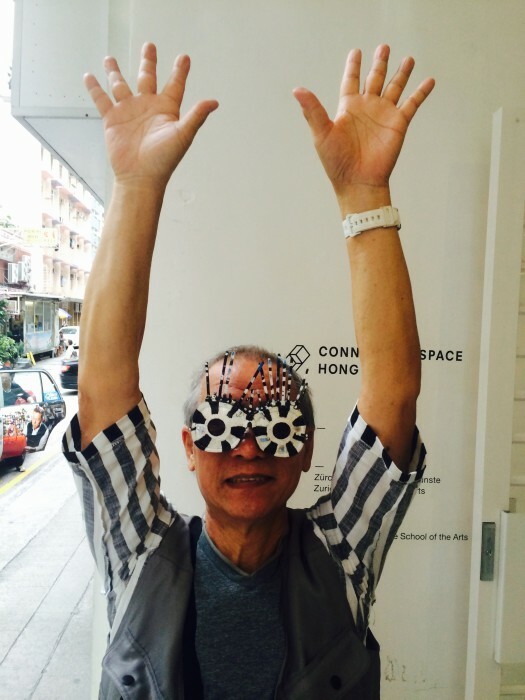 Frog King Kwok (aka Frog King) is one of Hong Kong’s earliest conceptual artists and a key figure in paving the way for performance art in Asia. Prior to forging new artistic ground within the Hong Kong art scene beginning in the late 1960s, Kwok studied with ink painting master Lui Shou-kwan. Whilst his peers were following the ink medium’s realist traditions, Kwok chose instead to translate ink into a new language by incorporating it into installations, conceptual works, and works he termed in Cantonese as happenings (hark bun lum). In the late 1970s, Kwok used found objects such as rotten eggs, fire, and plastic bags as materials to create sculptures and time-based happenings that took place in exhibition spaces such as the Hong Kong Art Centre and City Museum and Art Gallery. A firm believer in fully immersing himself—body, mind, and soul—into his artworks and the spaces around them, Kwok is a living embodiment of his practice. He works effortlessly across various disciplines, and has produced innumerable paintings, sculptures, installations, videos, graffiti, happenings, and spontaneous performances throughout his career. In 2011, he represented Hong Kong at the 54th Venice Biennale in an exhibition titled Frogtopia・Hongkornucopia. Eiko Otake is one half of artist duo Eiko and Koma, a collaborative pair of choreographers/dancers active since the early 1970s. Born to a family of writers, artists, and intellectuals, Otake came of age in Tokyo during the turbulent 1960s, an era of growing prosperity and occasional violent student protests. She met Koma, her partner in life and work, at this time, and they have been working together for more than four decades, mostly in the United States. Known for their exceedingly slow yet controlled, tense, and exquisite movements, Eiko and Koma are often cited as two of the world’s most important movement artists working today. Also a scholar of post-war Japanese literature, in particular the so-called A-bomb literature genre, Otake has over the last few years taken a deep interest in documenting episodes and spaces of trauma and disaster. Her recent solo works have centred on the nuclear catastrophe in Fukushima, Japan. In 1996, Eiko and Koma received a MacArthur Fellowship. The Live Art Writing Workshop introduces students to the fundamentals of art criticism. Sound, body, and live interaction are integral to contemporary art making. This two-week intensive programme explores writing about live art, and draws upon the Mobile M+: Live Art exhibition. It reveals the approaches a writer can take to report on ephemeral events, and teaches participants how to communicate their experience to a wider audience. The workshops, led by experienced art writers, are available in English and Chinese. Participants must attend all classes in their language stream. During the two weeks, they will study art criticism and essays, conduct peer reviews, visit the Mobile M+: Live Art performances and exhibitions, and work closely with their mentors to evolve critical writing skills. M+ will select participants through an online application process. The programme is open to undergraduate students enrolled in journalism, creative writing, English, Chinese, cultural studies, museum studies, fine arts, and art history programmes, as well as students from other related disciplines. Recent graduates working in relevant fields are also welcome to apply. Assignments may include a short editorial, critical review, or factual report based on the exhibition; these will be posted on selected online platforms.